Sometimes, reading some of the more negative reviews of GW2, I'm convinced the author and I are playing a different game. And its because we are. "How you play the game can completely change the perception you get of it." The conditioning players have experienced in other MMOs often causes them to miss some of the most amazing bits of GW2. And the game isn't showing them another way to play. Plenty of MMOs have conditioned players to believe that difficulty is defined by how complex the priority system / rotation is for the class. (Looking at you, feral cat John F* Madden.) MAX DPS is a solo endeavor. Learn a rotation. Do it well. And do it on every single boss. Ok, maybe coordinate some cooldowns from time to time. So GW2 - where there isn't really a rotation - seems simple. Individual damage can be max'd by hitting 1. Sometimes 2. Keep up buffs. Dodge stuff that hits hard. Stay out of the fire. Standard MMO fare, but with easier button pushing. But underneath that simplicity is a devilishly complex - and social - difficulty: coordinating combo fields and finishers. For example, using a blast finisher in a fire field gives might to everyone in the area. So 8 blast finishers = 24 stacks of might (25 is the cap). Which is 720 power / condition damage. Which is about one-third to half of the total power/condition damage of someone stacking that stat. For everyone in the group. Thing is, one person can't lay down the field and use 8 blast finishers quickly. That takes coordination. So difficulty is now social and coordinated, not individual. You will literally be hitting the same buttons over and over again, brainlessly, and not only will you succeed, but you will actually perform at almost max efficiency. The same is true of the game world. MMOs have conditioned players to expect that the UI will direct them where to go. No talking with NPCs to find hidden stuff. No clicking statues. Definitely no reading. Its a pretty fun way to play. But in GW2, its also a way to miss a ton of really fun stuff. 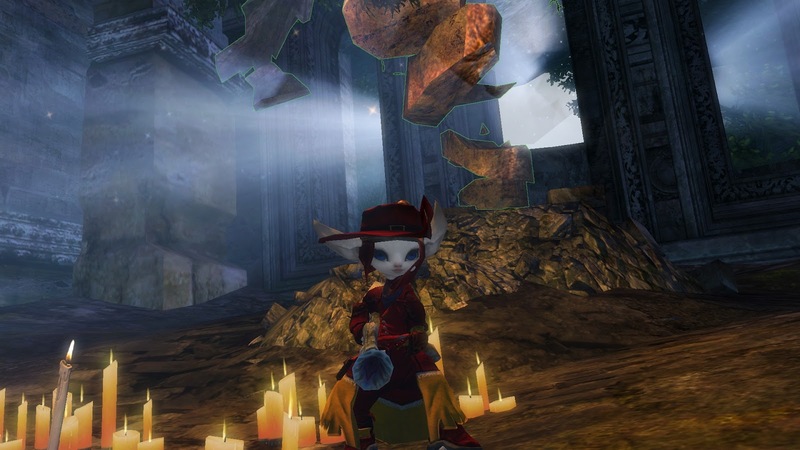 For me, it took the constant impending peril of death to make me realize GW2 is a little bit different. I started to notice things, so I went back on my main. Harathi Hinterlands has a statue. I'd learned from other statues that /kneel can yield buffs. Charr need no gods... but every cat loves its belly scratched. Its not just events. Its all those vendors I've been ignoring. Fleetze has a great post listing some fun and useful consumables found around the world. Summonable ranger pets for all. Instant vanish. Knockdowns. Fire fields. I'm probably going to lose half my gold porting to every vendor in the game and clicking the junk they have for sale, just to see if its actually useful. Oh goodness, did I just become a skritt? For just for a little more willingness to explore, I've found so much more depth to the game. thank you for reminding me what an awesome game this is. to this point, i've spent most of my time in spvp, but you've motivated me to get back into pve. hopefully some of the naysayers will learn what they're missing. then again, the gw2 community is probably better off without them. [GW2] Salvaging Scraps: Which Kit to Use?